Written in 2014 this post looks back at the feelings I had as I morphed from one world to another. An important process in the grief journey. For the most part, I have become accustomed to my new life post loss. Life never goes back to what it was before, but I have learned to live a new normal and take it all in stride. My new normal includes many parts of my old routine, but the backdrop has shifted, and the photos are minus one critical person. My new standard also includes my chapter 2, and as we create new memories together my life seems less awkward and out of place and more, well, normal. For nearly three years post-loss I often saw my life from a strange far off vantage point. I often felt like I was an observer in my world, watching from above, feeling like I was living parallel lives. I could observe the life that I once had, complete with my best friend of 15 years and my two beautiful children. At the same time I would watch the new life I was living as I had begun to embrace being a widowed mother of 2, and suddenly stumbling into a new relationship that was neither expected or requested. I can only explain this feeling as if I was floating above my body seeing it all, feeling it all, and yet somehow feeling completely out of place in both worlds. Huge parts of my being would pull me back to my old life while reality keeps me in the present. You see, my chapter 2 does not replace my husband. My chapter 2 is an entirely different person, and we are creating an entirely different life complete with the challenges that go along with my reality. My new reality is complete with the knowledge I never had before. This experience keeps me balanced, centered, and ever aware that my time on this earth is short and relatively insignificant. This new reality enables me to swing for the fences, follow my dreams, and love in a way I can not even put into words. You see with great loss comes this great perspective. I feel more deeply, I love more completely, and I take each day in stride knowing my problems are only as big as I allow them to become. I call this perspective the gifts of grief. These gifts are priceless, yet I do not wish them on one additional person in this world. I wish you all this perspective minus the pain that frequently accompanies them. I wish I had been gifted this point of view before I lost Mitch. I wish I could have given him the love, the patience, and the ability not to sweat the small stuff that I can gift to my chapter 2. I wish for each person who has not had to endure a great loss to cherish these gifts second hand via the lessons from the grieving. Every platitude we throw around is true….life is short, and while you are here, you should dance. Don’t wait until you live in a parallel universe to figure out what matters most. Embrace today for its many gifts and live endlessly and lovingly at the moment. 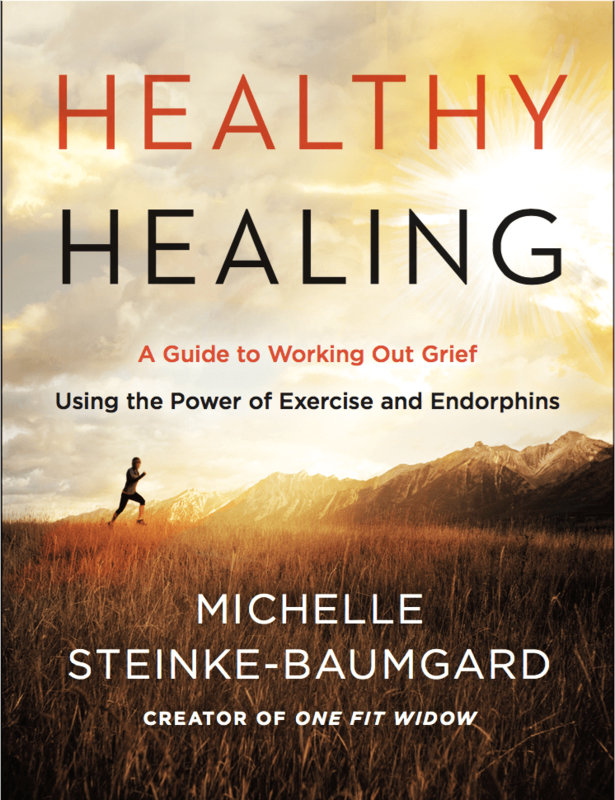 Pick up a copy of Michelle’s new book on presale, Healthy Healing, and learn how and why fitness matters during life’s hardest moments.